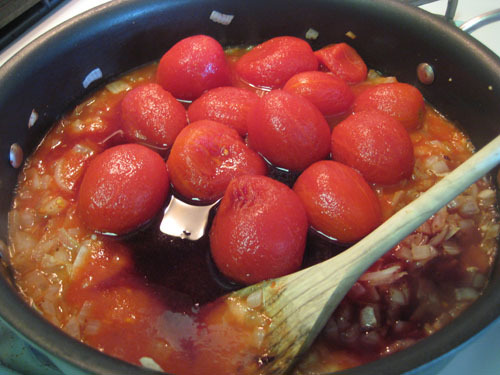 Texas Tales: My Recipes: Twofer Tomato Sauce! But... I have to teach a little kiddo his weekly swim lesson this evening, so I figured Mrs. Instructor betta not show up toasted. Thus the wine will have to wait until after I get out of the pool. You know what also makes me happy, though? You can't ever do me wrong by food. I eat a lot, which is something I'm working on lately (smaller portions just aren't as fun!). But I also love cooking and I try to keep it healthy in the kitchen. But no matter what kind of grub I'm chowing down on, food rocks! All of that being said, you get a two-for-one deal today. What's that? Ohhh oohh ooooh, I'm glad you asked. See, you might remember the husband and I's recent trip to Sur La Table for a cooking class for my birthday. If you don't (shame, shame! ), you can read all about our Tuscan courses right here. 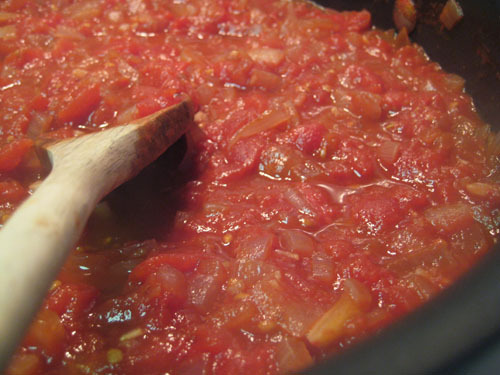 During class, we made the most thick, hearty and delicious tomato sauce from scratch. And it was way easier than I thought it would be! I couldn't wait to replicate it at home, so earlier this week I busted out my 28 ounce can of peeled, whole tomatoes and got to work. For the full recipe and cooking instructions, hop back over to that post and scroll down to the recipe images. You can click on the recipe, then zoom in or print for yourself and keep it in your kitchen. 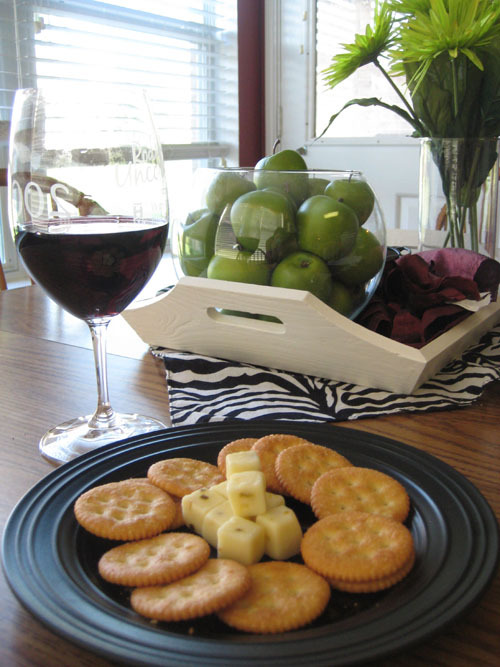 First things first, I did tackle that box o' wine and poured myself a glass, then set out some pepper jack cheese and crackers for when my husband got home. He's usually pretty hungry when he walks through the door and I may have snagged a couple bites for myself. Goodbye hunger pangs! I didn't have steak handy, though, so I decided to pair the sauce with some grilled chicken. I got my onions slightly browned in a sautee pan, then added the rest of the ingredients and set it just below medium-high to get it simmering. 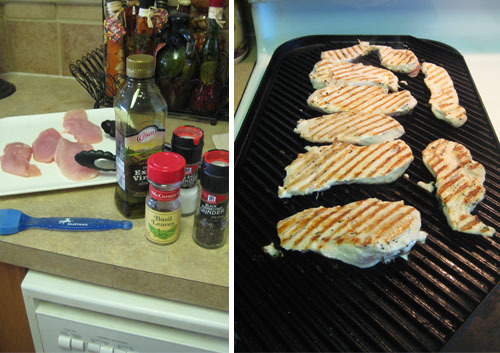 Next, I cut all my chicken breasts in half and slathered them with a little olive oil then sprinkled with basil, freshly ground sea salt and black pepper. For the sake of convenience, I just grilled them on our stove-top grill pan in the kitchen rather than hauling them to the big boy outside. They only took 6-8 minutes total to cook. I flipped them once they no longer stuck to the grill. 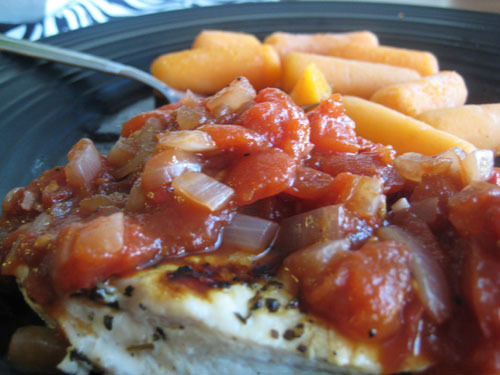 By the time my chicken had been prepped and cooked, the sauce was beginning to thicken and I'd gently mashed all the tomatoes with a potato mashers. Potato, to-mah-toe! But that's not all... this is a "twofer" tomato sauce post, remember? 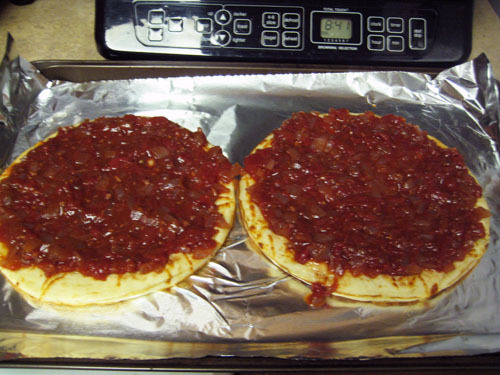 The next night I brought home two individual pizza crusts and loaded them up with the leftover tomato sauce. I also added hard salami (I just tore it up into pieces), pepperonis, low-fat shredded mozzarella, shredded parmesan, basil, sea salt and cracked black pepper. I threw on some quartered marinated artichoke hearts on mine. 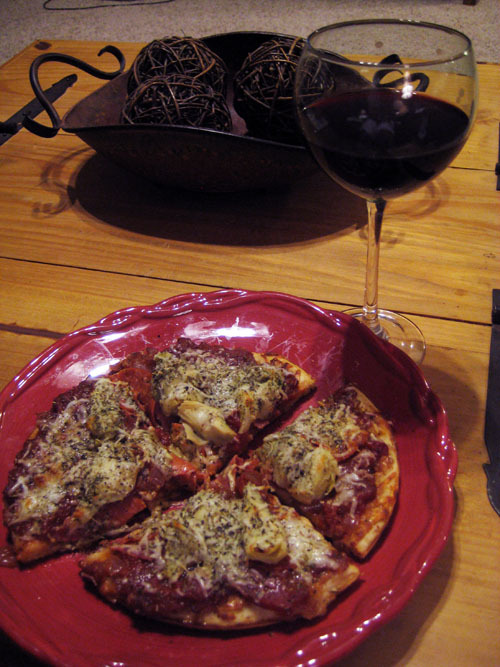 Baked for 10 minutes in the oven at 450 degrees and those bad boys were ready for fine dining... it was so good! Along with another glug of wine, of course. Trend? What trend? I don't see a trend here. What have you made lately? I'd love to hear all about it. Leave a link to your food post or type out the recipe in the comments section if you dare! You really know how to make our mouths water!! I am amazed at your ability to just whip up such tasty fare in such a short time!